Editor’s note: While name of this bakery has recently been changed to Galata Simitçisi, nothing else has changed: the same usta is still baking the same crispy, fresh simit. Let’s hear it for the (deceptively simple) simit. With only a few ingredients to its name, this sesame-encrusted bread ring has gone on to become the most ubiquitous snack in Istanbul, the undisputed heavyweight champ of the city’s street food scene. In fact, in recent years, the plucky simit has gone to even greater heights: once only sold from carts and by itinerant vendors carrying wooden trays on their heads, the snack is now the headlining act at several new, nationwide fast-food chains with names such as Simit Sarayı (Simit Palace) and Simit Dünyası (Simit World) (and has even made its way to New York). But despite its crisp exterior and tough street cred, the simit is actually a softie. Like a delicate flower that begins to wilt as soon as it is plucked out of the ground, the simit starts to fade as soon as it leaves the oven. By the time many simits reach the streets, they are already past their prime and heading towards a state where they make better hockey pucks or paperweights than snacks. That’s why we prefer to get our simits straight form the source. There are small simit bakeries hidden all over town, but one of our favorites is Çıtır in the Karaköy neighborhood, where the somewhat gruff Emir Özdemir has been manning the brick oven for 20 years. All day long, Özdemir turns out tray after tray of hot simits, either to hungry individuals passing by or to roving vendors who stop by to replenish their stock. Fresh out of the oven, the simit reveals its complexity, the contrast between its crispy/crunchy exterior and its soft, steamy interior more defined, and the earthy, nutlike flavor of the almost charred sesame seeds that coat it more pronounced. The knockout punch? All of this for only 75 kuruş (50 cents). Pow! 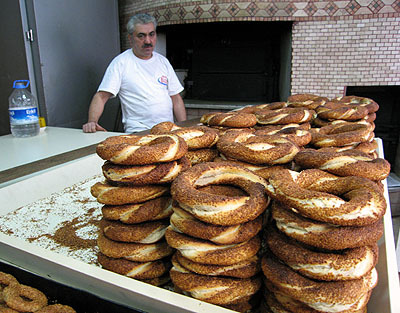 As a new arrival to Istanbul who already nursing a simit addiction, this article has spurred me to try to seek out the remainder of your top five. Emma, I am also a huge street food fan. Props to this site for writing about it! It took me a while to try kokorec- those intestine sandwiches you see everywhere- but last trip I got one and now I am hooked. One question, what’s the difference between the kokorec that looks like doner kebab sideways and kokorec that is cooked in a pile? Rich, it’s a only a difference in cooking style. The horizontal-doner style is usually cooked over coal and served in larger pieces. The piled kokorec is cooked on a hot plate and is usually heavily spiced. My understanding is that real kokorec lovers prefer the unspiced doner style. Hoca, thanks. I did my own kokorec taste test last night in the fish market of Beyoglu. The two are very different but, actually, i found the spice levels to be about the same. But the one cooked loose I found to be more greasy. the one cooked over charcoal was more crispy and had the smoke flavor. Both tasty, if you like kokorec!